Ah, summertime in Virginia—what a time to be alive! The minimalists out there can get by on sweat and swell weather, but we like to supplement our summer fun with some select items. Here are 8 things that we’re loath to start the sunny season without. In a season full of hikes, barbecues and beach trips, bringing along your best camera can be unnerving (not to mention laborious). We’re too in love with the digital format to stoop to disposables, so here’s our alternative: get an in-between! Find something sleek and effective within your price range and use it as your adventure camera. Summer means sun. You could slather yourself in sunscreen every time you’re about to step outside, but that gets tiresome quickly. Instead, invest in a quality sun hat and pair of polarized sunglasses. Your eyes and skin will thank you. Portable fun that gets you in shape? We’re sold. Slacklines are a tightrope-trampoline hybrid that was invented by a rock climbers in the 70s. They’re relatively cheap, portable, durable, and just about the most fun you can have on one axis. Beyond the ‘line itself, all you need are two suitable trees! Hammocks—or, as we like to call them, lazy slacklines—are made for summer in Virginia. 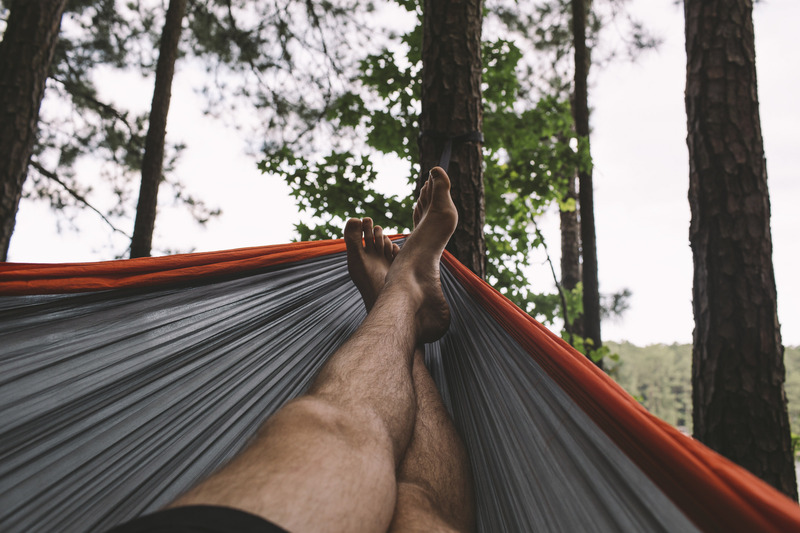 Trees and lovely weather abound, and that’s all you need for an ideal day of hammocking. If you can MacGyver a roof over your head, you won’t even need to invest in our next item. It’s time to upgrade that 2-person tent you’ve had for the last decade. Tents are efficient and affordable these days, and they can do all sorts of crazy things. Find one that’s right for you and start adventuring! Music makes any party better. Whether you’re in your neighbor’s back yard or deep in the woods, you’re going to want ample sound at your disposal. Grab the best speaker for your budget and pack it away. There’s always a dancer in the group, and they’ll thank you for your foresight. It’s hot and you’re hiking hard—hydration is key. Lugging clunky water bottles on your hike isn’t very efficient, so why not grab a Camelback? Depending on the model you opt for, you can store all of your goods and easily accessible water. Oh yeah, and we’re not above Camelbacking with beer once the summer parties start up. While you can pack pre-cooked food, is weighs you down. The best adventures are marked by self-sustenance: hunting, fishing, and gathering. Oh, and beef jerky. Find something compact but workable—even something as simple as a grill you put over your campfire. Grab these 8 before the summer solstice and you’ll be good to go! Looking for a home base in the midst of the Virginia beauty? West Broad Residences has big-city luxury in the small town of Falls Church. Reach out to us today!